We know that in a minor 251 progression, the 5 chord in the progression will usually be an altered dominant chord. 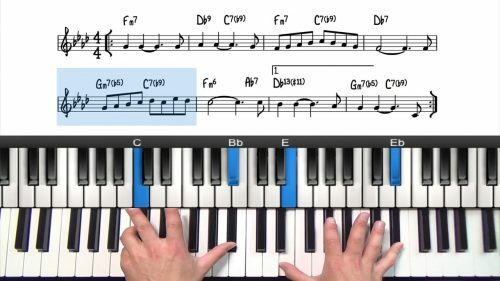 In this lesson we are going to apply altered dominant chords to the major 251 progression. Adding alterations is done by either raising of flattening the upper extension of the 5 chord in a 251 progression. This is most common on the 5 chord which adds extra tension and dissonance and then strengthens the sense of resolution to the 1 chord. How to practice altered jazz voicings? Well one way to practise these progressions would be to run through them through all 12 keys, starting off with a so what voicing for the 2 chord and then playing an upper structure of your choice for the 5 chord. The second way would be to run through all of the standards you can play and simply look out for major 251’s where you can apply these voicings. Something to keep in mind here is the melody over the 5 chord. If you can identify the upper structure that contains the melody note you can harmonise the melody with the upper structure. Something to be aware of is that it is difficult to do this on the fly or harmonise the melody like this whilst improvising. Instead you should examine the melody notes in your practise time and work out what upper structure triads work. We can play a SW voicing for the 2 chord with an upper-structure for the 5 chord. So let’s start of with a G So What chord which is a G minor 11. To get to C7#5#9 we play the tritone in the bass (E and Bb) and an Ab major triad in the right hand. The 2nd inversion of the Ab triad works best from a voice leading perspective. We can then resolve to any Fmaj voicing. We could take this further still and combine multiple upper structures on the 5 chord. Using the same 251 in F major. We start off with the G so what chord, then move to the C7#5#9 and then keep the tritone in our left hand but play a Gb major triad after the Ab major triad. This gives us C7 b9 #11. To get b9 #11 tensions, we build a major triad off the #11. We would then resolve this in the same way to an F major voicing. This is part 2 of the tutorial on dominant chord voicings. Here we explore voicing options for the natural 4th, #11, 5th, #5, 13th and the b7. The key is to memorise these voicings is to remember the formulas in terms of scale degrees. If you like the sound of one of the voicings... for example - a G7b9 chord. Open your fake book, or flick through the jazz standards you have learnt and look out for a G7 chord. When you find one, try your voicing, you will likely have to work out the notes using the scale degree formula. Perhaps starting with the root at the bottom and working up. By doing this you will retain the shape and the information much better… because you have taken the time to work it out.